This post is about Mani, Vini's son and Mai's husband, who was one of our men who achieved shaheedi in the Battle of Delhi, 1984. If we three were able to accomplish anything outstanding at all, it was from his good, loving, strong leadership. We believe he was one of the great people of the Twentieth Century, but, of course, we might be a little bit prejudiced in his favour. He used to say that we had to be prepared for whatever might happen because 'anything can happen to anyone at any time.' How right he was! Among us, he was the one who believed in the necessity of Khalistan; until all this happened, the rest of us thought he was something of an alarmist. Please read this gently, as it was very difficult to write. Mai writing: All this happened many years ago, and this is how I remember it. How can I write about my husband, knowing others will read it? He was, possibly, the most nearly perfect human being of our generation. I married him in 1970, lived our whole life together, every single day, until he achieved shaheedi in November 1984. I have absolutely no complaints about him as a person or as a husband. I knew him literally from the day I was born, when I threw up on him, until that day. I had never had any interest in any other man. I knew him to be intelligent, self-disciplined, kind and a bit fastidious. I knew he would never be interested in any woman who didn't live up to the standard he held himself to, so I always kept a tight rein on myself. Dad was always afraid I'd get involved with some idiot boy at school. He had nothing to worry about. How could a boy interest me, when I had always intended to marry this man? He was ten years older than me, so he was settled and grown up by the time I was expected to start to notice boys. This is also the chance to be introduced to my Dad, who was 67 when I was born and, fortunately, missed all the horrors of 1984, dying peacefully at age 97 in 1982. He looked at me for a minute. I said nothing. I felt suddenly shy. I nodded again. A third time, I nodded. 'I'd try, I'm sure.' He kept looking at me with that weird look. 'Are you still serious? Do you really want to marry him?' He was staring at me. 'Not a word, but he's always wanted to marry me, too. I know you think I'm young and inexperienced, but I have always known. Especially after he sang at my sixteenth birthday party.' I mimicked him singing. By that night we were informally engaged. His family and ours had always been close. Dad had been the business partner of Mani's grandfather and of his dad. He was his parents' only child and also my youngest brother's best friend, so he had always been around. In fact, he was the first nonfamily member to meet me when I was born, and the reason I got the nickname, Mai. The way the ten-year-old boy and new-born baby looked into each others' eyes and then she threw up on him had become a favourite family legend. By the time we got engaged, he had been to medical school and was a fully certified physician. He was also a devout Khalsa, which he would put before being a doctor or a husband or a father. It was the only thing, in fact, that he put ahead of me, which was fine. That came before everything, even wife, even child, even his own life, everything. 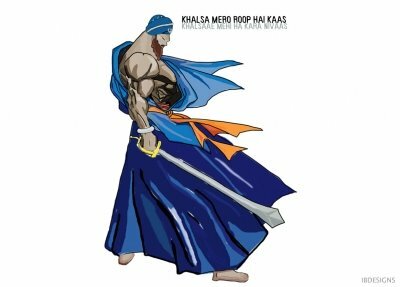 I think I can describe him in that one word: Khalsa. Pure. A true son of Guru Gobind Singh, if I can sound a bit cheesy, from the moment we woke up before dawn and took those horrible cold showers to when he fell asleep at night. He never tried to force me to do as he did, like those pre-dawn cold showers but in a true marriage, it's natural to stand together. He admitted to me after some years, that he didn't like those cold showers any more than I did, but he did it out of love and also as self-discipline. I would like to say something about him that doesn't involve being Sikh, but that was so much of him that there is nothing else to say. Maybe a physical description. Tall, athletic, kind of light brown skin in winter, darker, of course, in summer, as we spent a lot of time outdoors, rather bushy eyebrows, thick, curly black eyelashes (why do the men always have those? ), a nose slightly too large for American tastes, but perfect for an Indian, steel grey eyes, courtesy of his Kashmiri mother (That's me, Vini!) and all that hair. He wouldn't even let me see it until after we were married. I told him he was as bad as a Muslim virgin, but he just laughed at me. It was thick and straight and longer than waist length and was as black and shiny as obsidian. I felt almost naked with my dark brown, rather thin hair. At least I could match him for length in those days. His beard did have just a touch of red in it, maybe again from his Kashmiri side. I enjoyed looking at him, and he could hardly take his eyes off me. We were the most perfectly matched couple I have ever seen. We had fourteen incredible years together, and would have had many more, if he hadn't been killed. I don't feel like describing that day again, so let me jump to immediately after the mob had left and I had regained consciousness. As it turned out, at that time he was also still alive. Whatever kind forces exist in the universe, whether Waheguru or Guru Nanak Dev Ji or some other benevolent being or just the universe itself, we had a few peaceful minutes talking together before he died. Most of that conversation was so intensely personal that I can't write it down. I will only mention three things. Then he insisted on a promise from me that I would remarry, so as not to spend the rest of my life in useless grieving for him. As if marrying another man would end my grief! But I have done as I promised, and my current husband treats me like a queen, and I have come to love him deeply, too. Then he asked me to sing the last verse of How Can I keep from Singing?, an old Quaker song. My singing voice is between a crow and a foghorn, and I can't carry a tune, but I complied. As the final sounds came out of his mouth, he opened his eyes and looked, first at me, then beyond me. An expression of astonishment and pure joy (ananda?) came over his features. His hand went limp in mine, but I held it for I don't have any idea how long, until I dropped it, closed his eyes and kissed his forehead. It all sounds so romantic now, the fallen martyr soldier-saint, the grieving, loving pregnant widow, herself nearly fatally injured, the lull in the battle. At the time, with the signs of violence all around us, I, paradoxially, felt a deep inner peace. I lay down beside his body and passed out/went to sleep. That is the end of his story. To any man reading this, just a suggestion. Try to be a man your wife would write so lovingly about. You can do it and she'll be most grateful, I'm sure. These stories sound so real and you guys write so well, that they are actually hard to believe... so many people I know are being skeptical about them.. but I hope this stops because that is a hurdle. The information you will give (hopefully) about what happened with families in 1984 is important for future generations to know. What I meant by "this stops" is I hope the skepticism and doubt stops. Whether we are believed or not is unimportant to us. Our purposes are now stated on the right-hand side of this blog. The first is being achieved. If the second and third can be even a little bit accomplished, we will be overjoyed!! Thank you for complimenting our writing. Waheguru ji ka khalsa, Waheguru ji ke fateh!Mai wrote that answer and she doesn't care if we are believed but I do. Mani is my son and his story needs to be told and believed. I wasn't even able to see his dead body and this is all I have. I know all this supernatural stuff is strange shaheeds and Guru Ji, but if Mai and Suni said it happened, it did. Nothing like that ever happened to me. Whoare these so many people? Its so strange that people are reading this. No I don't think it is strange that many people are reading this. 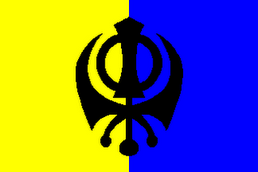 I saw this blog on a forum, then it was on a website, soon it will be on many Sikh websites. 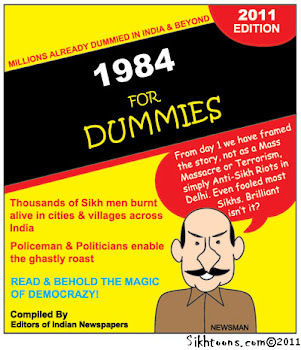 The Sikh people have a very very fragile, tender, wounded part of their heart.. labelled "1984." They will always, whether in public or private, want some answers, or share some stories, to lessen the grief, to get some empathy, to unite for justice. I have no way of knowing who he was greeting. His eyes were closed and when he opened them he looked first at me, but then something else got his attention and made him very, very happy. I know my husband and I have always hoped that he saw Guru Gobind Singh Ji.